Stores the alignment data associated with a given pointer and address space. 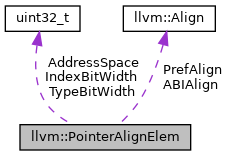 The unusual order of elements in the structure attempts to reduce padding and make the structure slightly more cache friendly. Definition at line 89 of file DataLayout.h. Definition at line 130 of file DataLayout.cpp. References ABIAlign, AddressSpace, assert(), IndexWidth, PrefAlign, and TypeByteWidth. Definition at line 144 of file DataLayout.cpp. References ABIAlign, AddressSpace, IndexWidth, PrefAlign, and TypeByteWidth. Definition at line 90 of file DataLayout.h. Referenced by get(), and operator==(). Definition at line 93 of file DataLayout.h. Definition at line 94 of file DataLayout.h. Definition at line 91 of file DataLayout.h. Definition at line 92 of file DataLayout.h.